Back to work today, I can't believe the festive season is now over :(. I started off the day feeling really positive but it is 3.30pm and I am looking out the window to a dark sky and I am feeling less positive. I wanted to really get fit this year my thinspiration is Ashley Sky but when I am in this sort of mood the gym is the last place I want to be! I had a lovely first day of the year, as I was feeling fresh I headed off to London for a mooch around. My first meal of 2013 was of course dim sum, my favourite! I then went for stroll through Hyde Park and ended up in Harrods looking at the puppies, which is one of my favourite places to go in London. I mean puppies make everyone happy right?! I also managed to get my hands on a pair of leggings in Topshop Knightsbridge which I have wanted for ages, I always forget how good that Topshop is! I wore a few new purchases yesterday, one being the only sale item I picked up-which is this necklace from Dorothy Perkins. 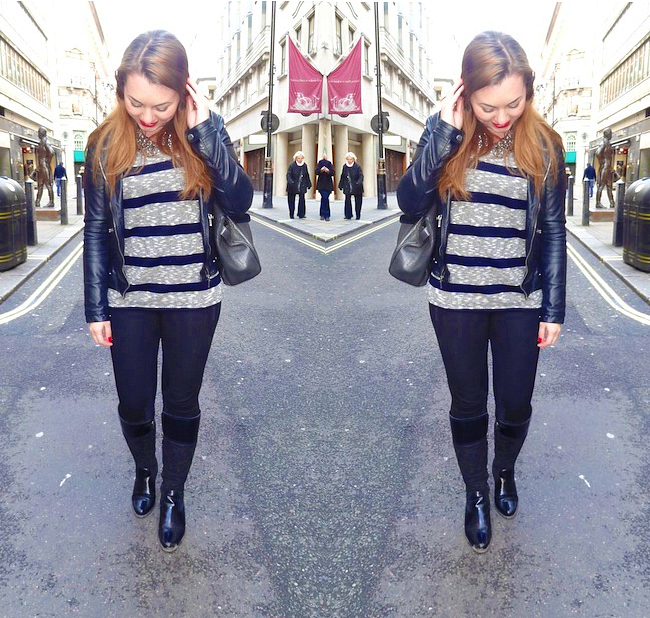 I never think to look in Dorothy Perkins but they have some really nice pieces, I also bought this stripey jumper as it one of these easy pieces to wear and is nice and baggy and comfortable.Do you shop there often? Isn't today supposed to be the most depressing day of the year? What do you think? Also any hair experts out there, what can I do about my hair as I hate the colour now. Basically in September a hairdresser ruined my hair so it had to be stripped and copper tones were the only colour they could use. But now it has turned very light and is more ginger, plus my roots are really dark. Am I better off getting it dyed again or just letting it grow out? I want to be chocolate brown again not this funny colour! haha. You look great! Lovely outfit! NYE Make Up, Hello 2013!